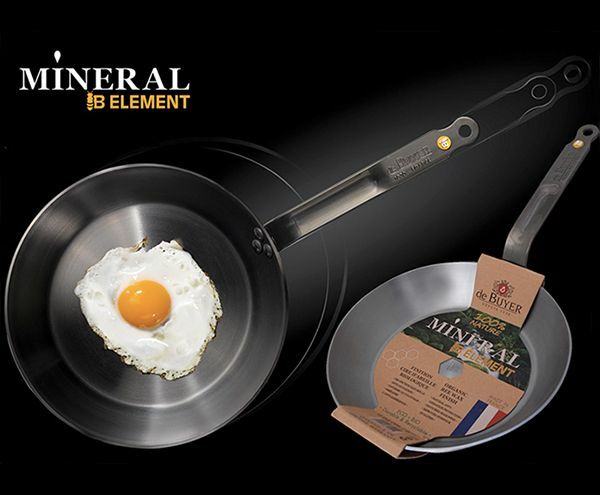 The iron MINERAL B ELEMENT fry pan: a 100% natural material with protective organic beeswax finish. It is guaranteed coating-free (no PFAO or PTFE). No added chemicals and made with an environmentally-friendly manufacturing process. Robust, recyclable and professional product. The fry pan reaches high temperatures and quickly seals food, thereby preserving vitamins and nutrients. Ideal for Sealing, Browning, Grilling. Seasoning: the more you use the fry pan, the better it cooks. The blacker it gets, the less it sticks. De Buyer, created in 1830, is based in the Vosges, France. De Buyer’s expertise and excellence has been rewarded with an EPV (Living Heritage Company) label, a distinction awarded by the French government. De Buyer’s utensils are greatly appreciated by Professionals and the company works in partnership with many training centers, including the Institut Paul Bocuse, the Ecole Nationale de la Pâtisserie (ENSP), the Ecole de Cuisine Alain Ducasse, the Masterclass of Christophe Michalak, the Ecole Ferrandi, the Ecole du Grand Chocolat Valrhona in France, the Ecole At-Sunrice GlobalChef Academy in Singapore, the Enderun Collège in Manila, the Kingsway Westminster College in London, and still, the Culinary Institute Lenôtre in Houston.